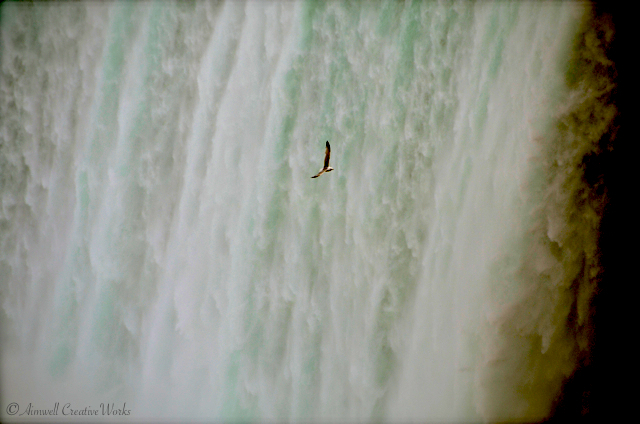 A seagull, a force of nature in his own right, wings it within range of powerful Horseshoe Falls, Niagara. I could have watched him play all day. This entry was posted in Photography, Weekly Photo Challenge and tagged Aimwell CreativeWorks, birds, Dorothy Chiotti, force of nature, Niagara, postaday, Travel, water, Weekly Photo Challenge. Bookmark the permalink. I could just feel and hear the roaring thundering sound of the waterfalls and the flight of the gull seem effortless. Great shot. Gulls are tough and resourceful. Beautiful photo Dorothy! Two forces of nature in one amazing photo. Great shot! A truly memorable photo Dorothy. Thanks for sharing it.